Next year I will be leading a group of travelers to Turkey where we will visit the area where the seven cities where the seven churches of the Revelation were. 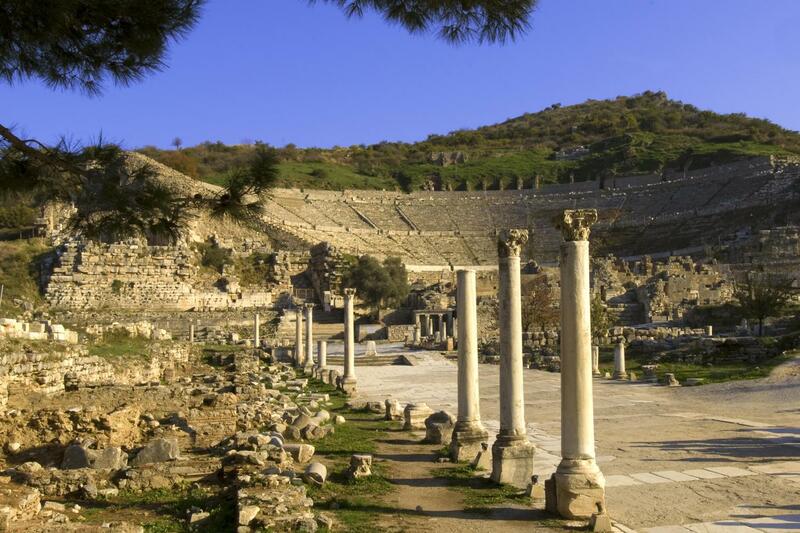 Back in 2010, Gayla and I had the opportunity to visit Ephesus, and we were amazed at what we saw and experienced. We said then that we would love the opportunity to come back. We plan to travel in April 2016. The specific dates are April 11-16, 2016, and there are a couple of extensions available. One of the seven churches of Revelation was in Ephesus. The city boasted one of the largest populations in Roman Asia Minor. Famed for the Temple of Artemis, one of the Seven Wonders of the Ancient World. Ephesus contains the largest collection of Roman ruins in the eastern Mediterranean; although, only about 15% has been excavated. The ruins give some idea of the city’s original splendor. The 25,000 seat theater dominates the view down Harbor Street, which leads to the silted-in harbor. I guarantee that this trip will be worth your time and investment. When we led the Holy Lands tour in 2014, we used Maranatha Tours and we were not disappointed. Everything from the travel arrangements, first-class lodging, meals, and the tour guide was top notch. I have brochures available which describe the details of the trip.